Valet services ($15) on weekends only. Street parking available any day of the week (first come first serve). Join Havana every Friday and Saturday for cocktails, dancing and live music from your favorite Chicago bands. No cover charge, music starts at 11:30pm and ends at last call! We cater to your home or office, private events and business meetings. 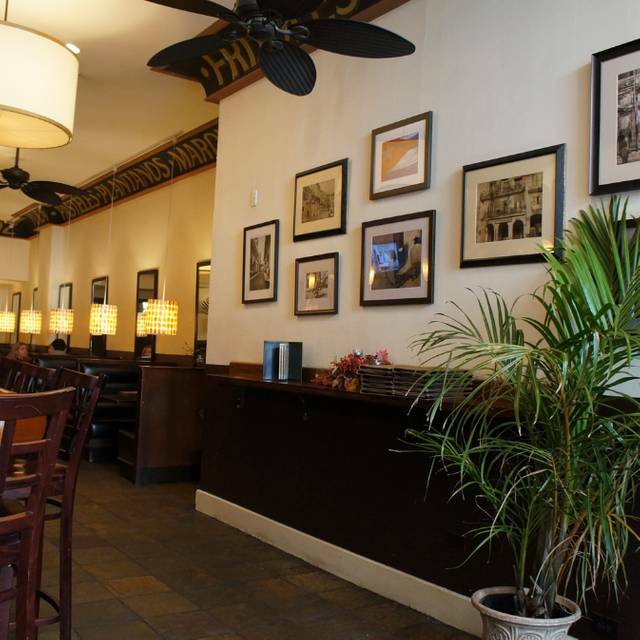 Warm, cozy, and inviting private room available for special events, meetings, and all other occasions. Our space can accommodate small and large events with space for 45+ people. 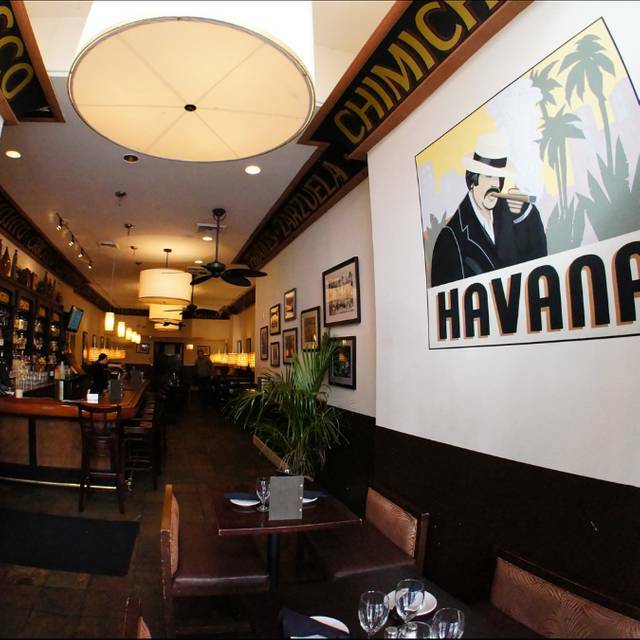 Located in the popular River North neighborhood of Chicago, Havana features a unique 1940s art-deco themed interior and large windows that showcase Clark Street. 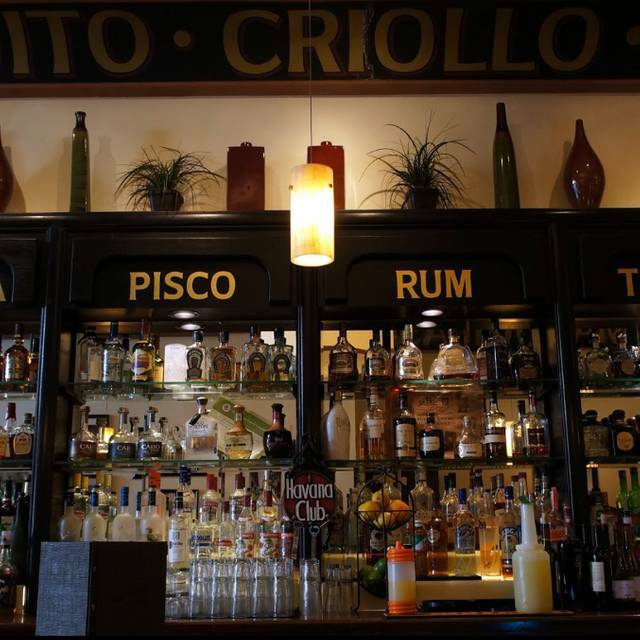 Along with the large variety of Cuban-American cuisine and specialty drinks, Havana also offers many delectable Cuban desserts and coffees to complement the perfect meal. 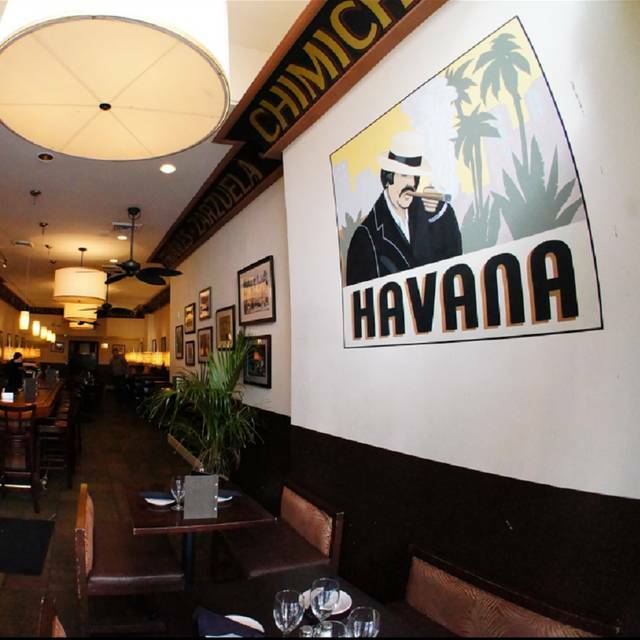 Whether you're interested in trying the fresh Ceviche Mixto, or just want to share a night out with friends over our mouth-watering mojitos and live music, Havana is the perfect restaurant for you. Loved it! Food was very good and tasty. A nice spot that I definitely will come back to. 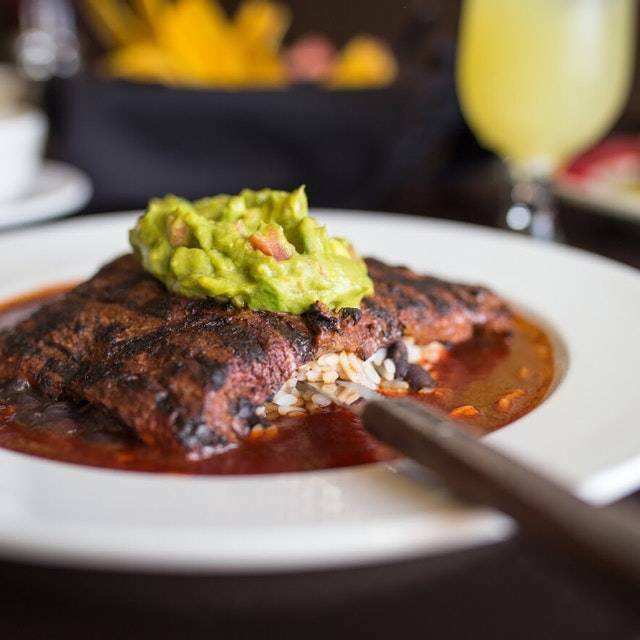 Too loud... and if you really want to be authentic to the cuisine, add pallomilla steak to your menu and include white rice with your dishes. This place has a great vibe, drinks, and food. Highly recommend. Not how I remembered it. Cuban sandwich was very good, but the rest of the food was just ok. And get ready for a very noisy meal! Amazing live music and DJ on Saturday nights. and those guava mojitos... fantastic! Food was great and the live band was awesome! 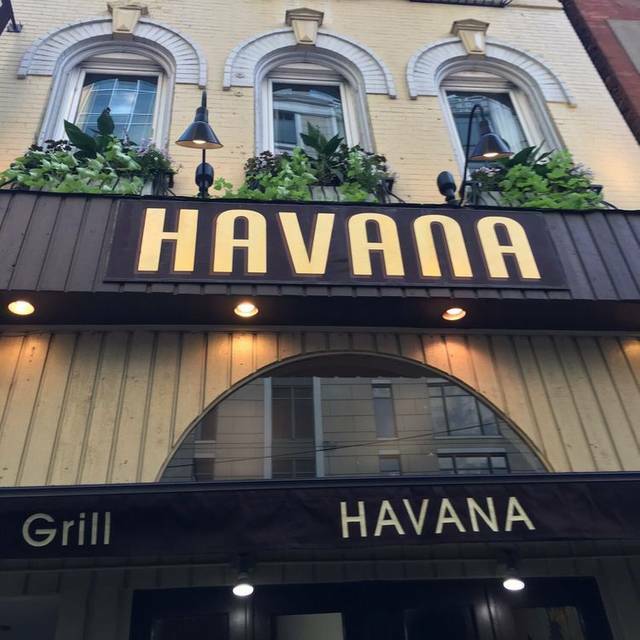 I have dined many times at Havana and was expecting that I would again be satisfied with the evening. Unfortunately it was not. I arrived a little before 5:00 pm so the restaurant was empty. I was seated waiting for my friend when I watched a woman come through the door who immediately went straight behind the bar. Initially it thought she was stopping to talk to someone. Well I was wrong, she immediately took off her coat and bag, stuffed in a space at the bar. She did not miss a step; she with her nasty hands proceeded to dig into the ice and proceed to making a drink at the one person at the bar. She never once washed her hands. I was disgusted and mentioned it to my server. His response was that he didn’t see it, but would have someone else our drinks. I wanted to leave, but was waiting for my friend. My evening was ruined as I could only think of what other nasty people were preparing food. I WILL NEVER GO TO THE RESTAURANT AGAIN. I am a fan but a little perturbed by the "nickel and diming" done by the restaurant. They charged me 75cents/each for 2 little cups of hot sauce and $1.50 for bread. I like the food and drinks but those additional charges are petty and cloud my intentions about returning. Love the food and the sangria. A little noisy but it's a go to place when I want to get a group together to celebrate. We were on a short Spring break trip with our children (ages 2 & 10). The atmosphere was great, the food was amazing and they were so kind and accommodating with our children and stroller storage while dining. Much appreciated and we will be back! I love this restaurant, and come here quite often. We were done eating and waited HALF AN HOUR just to get our bill, which we had to request. Our waiter was watching TV, not busy at all. No apology, nothing for making us wait so long. Very disappointing. Good vibe. Good food. Excellent for couples or a small group. Prompt and friendly service. 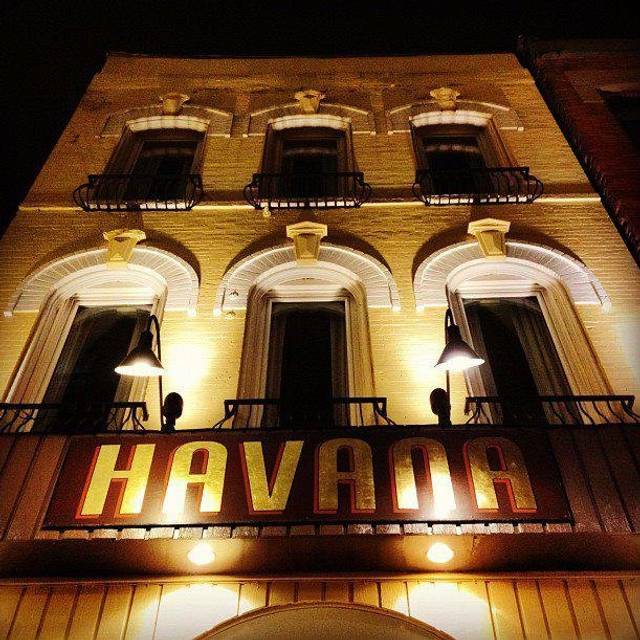 Havana was our favorite restaurant in Chicago. Can’t wait to come back in our next visit. Great food and Mojitos! We will be back. The service was average which was weird because it was not crowded. Last time I was here it was packed and loud, but that was a Friday after work. Thanks so much for the birthday cake! The wait time does not coincide with Open Table. I was told 45 minutes to wait yet I was able to book a table on the app within a 20 minute wait time. The staff was nice, however. The food was good, especially the fish tacos. I would say that the tostones were not amazing, but fulfilled the need for an appetizer. The mojitos has too much lime. I would be willing to try it again. Great service with an attentive waitress. Despite the busy holiday, the staff was great & did their best to keep up. Food was served slightly luke warm, seemed it was left out a while before being bought to the table. Fudge cake was still somewhat frozen from the freezer. Flan was the highlight for dessert. Appetizers were delicious & entrees as well. It was super busy for st patricks day and a friend waited 20 minutes to get their drink after we got ours but the food was amazing and best mojitos I've ever had. 5 stars for food and drinks. You have to get the pulled pork on jalapeno mashed potatoes. The white gravy with that was superb. Calamari was a little overdone and not spicy as I expected it would be. Very inexpensive alcohol. Don't waste time on desert looks like these are brought in from somewhere else. Food was horrible. Poor presentation, flavor wasn’t there. Great looking restaurant, service was great but food was bad. The menu has a nice variety of appetizers and main entrees. Waiter was very attentive. I had the Paella which was delicious. Great food & yummy drinks. My coworkers and I had a great time & would love to come back. Definitely an awesome first experience! The food was great the service was poor. Also if you’re not Spanish you get the bare minimum of customer service. At least on this Friday night. I probably won’t ever go back. Disappointed, food was decent and the only saving grace. We waited for 40 min for our 8:30 reservation only to be sat at the two person table we were standing in front of the entire time which was EMPTY. First time there but not the last. What an awesome experience. The food was amazing, service very attentive and the place was just plain fun. 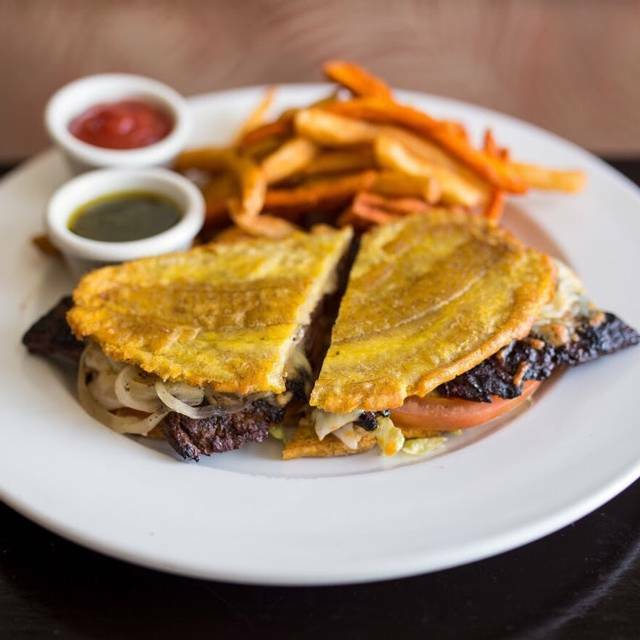 Try the roasted pork or the empanadas. And the tortilla soup is killer. Enjoy! Great cubano sandwiches. Very nice staff. Flan was delish! Cute atmosphere. The food was amazing. Staff was friendly and helpful in deciding what we should try on the menu. I will definitely be back. 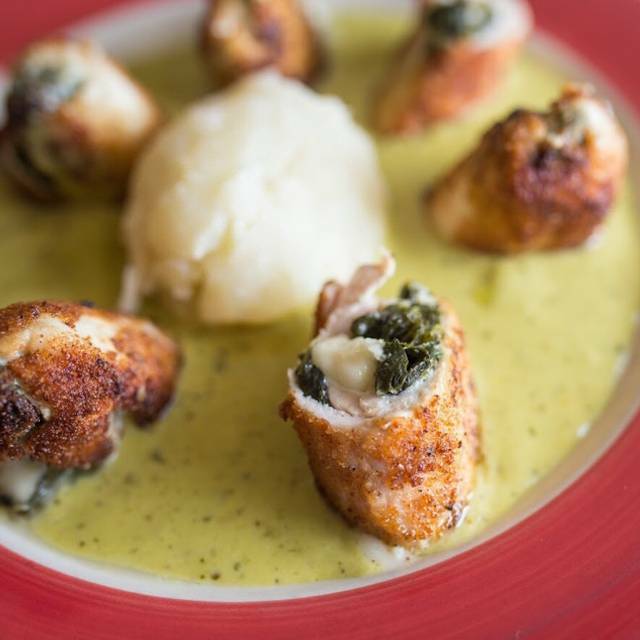 Good food, good value and great service. The food at Havana is ABSOLUTELY AMAZING!!! The empanadas and mojito flights are a must have!! The ambiance is nice and authentic Cuban. The host and wait staff are extremely accommodating and kind. Thank you for a great experience...we’ll be back soon!! This was the first time I went to Havana. It was great. The food was delicious. I would definitely recommend the tequila steak. I brought my girlfriend and parents here for my mom's birthday after having been to Havana once before. It didn't disappoint. Given the occasion, I had left a note on my reservation asking that a dessert be brought out for my mom. At the end of the meal the server brought out a delicious piece of chocolate cake with a lit candle - free of cost! My dad mentioned to the server that steak on his jibarito was slightly overcooked and the meal was immediately taken off of our bill. All other three meals (and appetizers) were tasty and exceeded expectations. Food was flavorful and the service was EXCELLENT. Havana has gained a loyal customer! Overall experience was amazing!!! Service was on point and recommendations were so delicious and glad we listened to him!!! Great little place with amazing food & Mojitos!!!! Definitely a great spot for a quick bite or to take you time and enjoy!